Get event notifications about clicks, completed video views, or converted installs. Go to the Callbacks panel in your dashboard. Name your callback and give it a description. Select your role (advertiser or publisher). 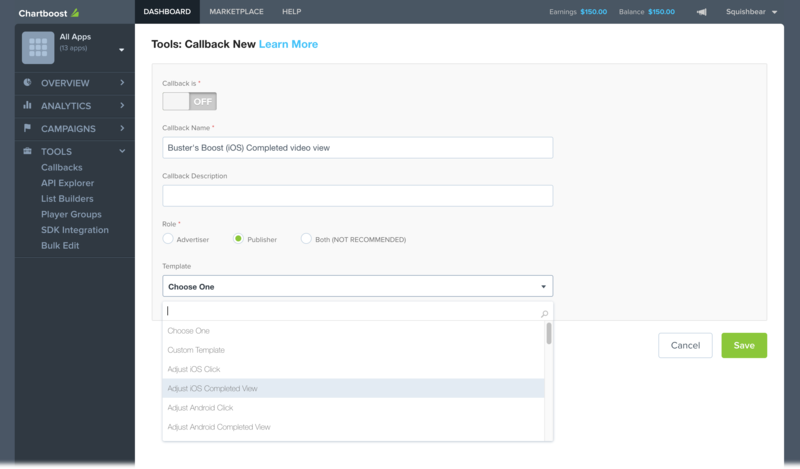 Only select BOTH if you are both publishing and advertising in your app and need callbacks for both roles. Choose a template for your callback. Using third-party vendors: Chartboost provides preconfigured callback templates for most third-party vendors. Click a template to automatically fill in all the required parameters. You might be prompted to add your bundle ID or other information. Tracking URL: The endpoint at your server or third-party tracking service where we’ll be sending the callback (e.g. https://myserver.com/tracker). Our system appends static and dynamic parameters to this URL as specified. Static Parameters: Include static key-value pairs in your callback URL’s query string. To include a static parameter like network=chartboost, you’d add network in the Key field and chartboost in Value. Dynamic Parameters: Decide what additional information to send about the event. Input the parameter name supported by your endpoint in the Key field, and then select a macro value from the dropdown. You can refer to these parameters for help. A Chartboost POST callback does not include data in the body of the request. Instead, it includes the data as a query string appended to the URL, similar to a GET callback. Switch your callback from OFF to ON and then click Save. Attaching a callback to your apps: Open any callback from your list and scroll down to Select App. Checkmark which of your apps will have a click, install, or completed view callback attached to it. Alternatively, select any app from the top left of your dashboard, go to its Basic Settings > Advanced Settings, and attach callbacks from the dropdowns there (see screenshot below). Attaching a callback to your campaigns: Open any callback from your list and scroll down to Select Campaign. Checkmark which of your campaigns will have a click, install, or completed view callback attached. Alternatively, open any of your advertising or publishing campaigns, go to the campaign’s advanced settings, and attach callbacks from the dropdowns there (see screenshot below). If the app associated with this campaign already has this callback attached to the same event, you don’t need to attach this callback to the campaign. Attaching a callback to your entire account: Open any callback from your list and scroll down to Account-Level Default. Checkmark the Install, Click, or Completed View box to attach the callback to all click, converted install, or completed video view events in every campaign in your Chartboost account. We generally do not recommend attaching callbacks at the account level. If want to use server-to-server (S2S) tracking, you need to manually request activation from your account manager. If you don’t need S2S tracking, you can skip this step. To copy a callback, open it and click Duplicate at the top of the page. Click X to delete a callback from your list. Click the pencil icon to edit a callback. Click the pause icon to pause a callback. You’ll need a server that’s ready to support real-time events. We make three attempts to deliver callbacks to your server. If all attempts fail, your endpoint will be blacklisted for 15 minutes. During blacklistings, the callbacks will not be sent or attempted until the full time has elapsed. Our service deems a request successful if your server responds 2xx. Callbacks can be a redirect URL, but cannot have any store (App Store, Google Play Store, Amazon Appstore for Android, etc.) as a final destination. They must also be valid URLs. For the most reliability, do not use redirects. The endpoint must support SSL via HTTPS. All data is URL-encoded before being sent.